Long before there were doctors and high-tech medications, people were growing their own herbal remedies so that, through the simple act of gardening, they could manage many of the ills that befell their family members or themselves. 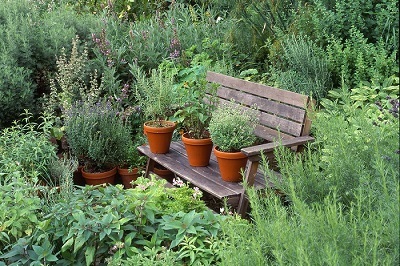 You, too, can grow your own herbal medicine—in the garden or in pots you keep in front of the window. Common herbal remedies can be grown, gathered, steeped in teas, or put in ointments. Here are some herbal remedies that you can grow in the comfort of your own home. Basil – Basil can be grown in a pot in a sunny room or on your porch. It helps people with poor appetite, flatulence, lacerations, and scrapes. It’s an annual plant but grows to a nice size for picking the leaves and using them for food or medicinal purposes. Chamomile – Chamomile can be used as an infusion or in an ointment for topical applications. The flower heads of chamomile can help relieve tension and anxiety; it also works to ease symptoms of colic and indigestion. Topically, it helps with skin irritations and areas of inflammatory skin conditions. Echinacea – This perennial plant makes flowers that can be used for colds or flus. It has been shown to enhance your immune system so you can fight off viruses better. Try Echinacea tea for when you’re not feeling well and down with the flu. Feverfew – These plants have leaves and flowers that can be steeped in a tea or chewed in order to control fever, headaches, arthritis, and various skin conditions. Johnny Jump Up – This plant has many anti-inflammatory properties so it can be used as a tea or for topical application in conditions like eczema and blemishes of the skin. Used orally, it can loosen phlegm when you have a chest cold. Lavender – Lavender has great properties when it comes to relaxation and calming. It is used as aromatherapy for those who want some stress relief. Apply it to cuts and bruises in order to act as an antiseptic to decrease the risk of infection. Lemon balm – Lemon balm can be grown in a pot or in your garden. It can be used for many things, including the relief of anxiety, herpes infections, insect bites, insomnia, indigestion, and flatulence. When topically applied in an ointment, it can lead to faster healing of cold sores. Marigold – Marigold is good for skin conditions, such as sunburn, blemishes, acne as well as systemic conditions, such as stomach ulcers and indigestion. Parsley – Parsley is easily grown in an indoor garden. A healthful herb also helps in situations of bad breath or flatulence. Peppermint – Peppermint is a great herb for gas or digestive problems. It can be made into a tasty tea that also helps people with headache pain. Rosemary – Rosemary is an herbal remedy that helps improve mood as well as memory and concentration. It also helps ease bad breath. Sage – Sage was used for medicinal purposes before it was used in cooking. It helps people with inflammations of the mouth and throat. Thyme – Thyme is a very strong antiseptic that works for people who have congestion, gas, cough, or indigestion. Steep it as a tea or take and chew its leaves. St. John’s Wort – This herb is used in many places in Europe and the United States for the management of mild to moderate depression. It is also used for symptoms related to depression, such as insomnia, loss of appetite, anxiety, and fatigue. You can grow the herb yourself, using the leaves and flowers in a tea to improve your mood. You don’t have to have a huge herb garden. Start with a few items and build-up as you gain experience and see how you can relieve many of life’s ailments without using any kind of over the counter or prescription medication.